Pictured as: the Neptune (Puget Sound Tugboat Company) Photo by: P.S.M.H.S. Built in 1904, by the Spedden Shipbuilding Company of Baltimore, Maryland as the passenger steamship R.M. Woodward for the United States Public Health Service. 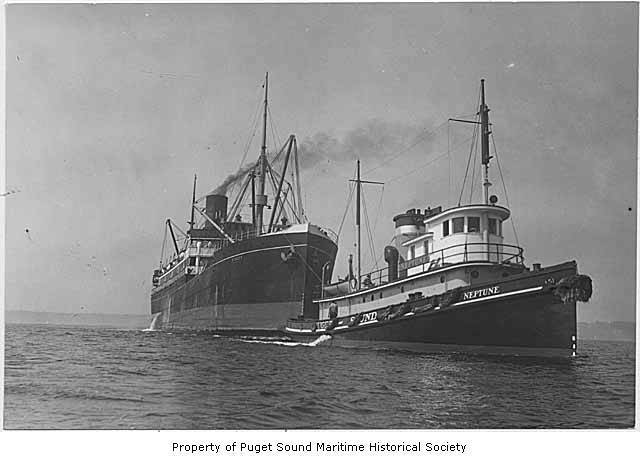 In 1937, she was acquired by the Puget Sound Tug and Barge Company of Seattle, Washington. Where she was converted to service as towing vessel. And she was renamed as the Neptune. In 1946, the tug was acquired by the Foss Launch and Tug Company of Tacoma, Washington. Where she was renamed as Wedell Foss. In 1980, she was sold, and renamed as the Maggie F. She eventually sank at her mooring on the Carquinez Strait at Crockett, California. And, was not salvaged. The tug was powered by single, sixteen cylinder, General Motors diesel engine. R. M. Woodward, Neptune, Wedell Foss, Maggie F.
United States Public Health Service, Puget Sound Tug and Barge Co., Foss Tug and Launch Co.